a game? like a peg-style board game? 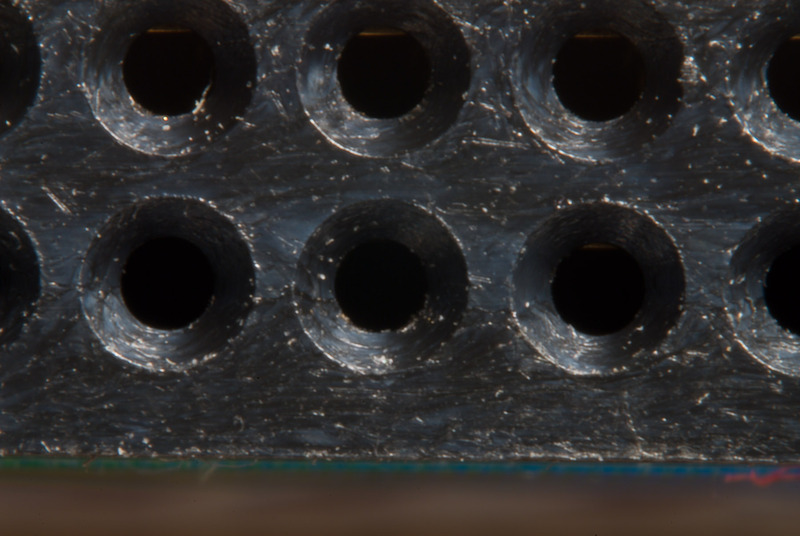 Looks a little like the bottom of a CF Card. If that’s the case, holy macro Batman. Looks like it’s part of a gas burner grill grid to me. A missile launcher pointed at your by house right-wing extremist groups trying to rid the country of impure foreigners! There appears to be some sort of metal contact inside each hole. I’d say it’s the female side of an electrical interface socket. Well, given that you’re currently into macro work, I think it looks awfully like the business end of a Compact Flash card. In fact I photographed one myself to check! Curious how it looks rather metallic – as did mine. Good call Peter. I’d have to agree on it being a PCMCIA socket. I don’t know, but I’m kind of leaning toward the missile launcher idea. It goes inside of a keyboard–each of the holes is a separate key. I don’t know what it is but I’m making pizza tomorrow and I’d like to borrow it to grate some cheese.